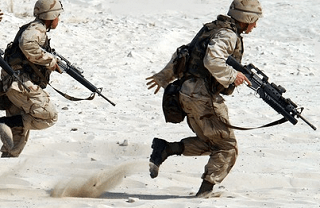 Do You Know This Basic War Vocabulary? It’s unfortunately necessary to understand war vocabulary if you want to follow the news or study history in English. The words below are nouns (n.) unless they have a note that they are adjectives (adj.) or verbs (vb.). Many have a singular form ending in ‘y’ with a plural ending in ‘-ies’: ally/allies, army/armies, enemy/enemies, navy/navies, sentry/sentries, etc. 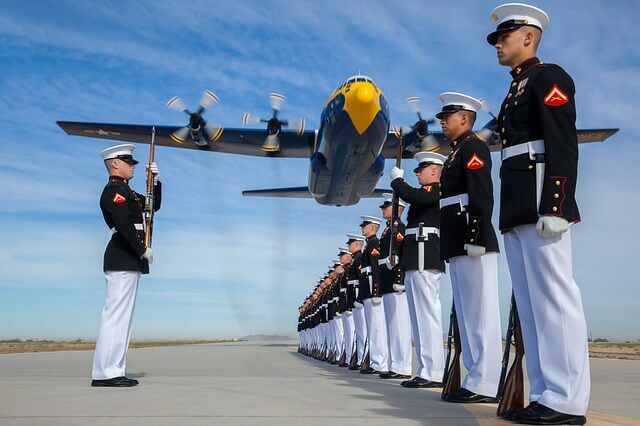 Military is an adjective or noun meaning related to a nation’s armed forces. Civilian (also adj. or n.) means someone or something not in the military. Enemies or opponents are nations or people fighting against a country. Allies are nations on the same side, supporting each other. Neutral countries are nations that are not involved on either side. War is a violent conflict between two or more groups (usually nations). A battle is a violent encounter between opposing sides, often as part of a larger war. A revolution is a struggle between large groups (often those who have been powerless trying to seize power from the current dominant class) that leads to a major change in government and society. A rebellion (or revolt or uprising) is major resistance to the current government. Any of these, if successful, lead to a change in government or at least concessions from the existing government (agreeing to meet some of the demands of the rebels), but the changes do not normally overthrow class relations and social arrangements as a revolution does. To fortify something (a vb.) is to make it strong. Forts are buildings with strong walls to guard important places (like rivers, beaches, mountain passes, or other key entry points) from attack. Fortifications are any protective walls, trenches (ditches to hide in), forts, etc. built for protection. To guard (a verb: vb.) is to watch over and protect someone or something, and a guard (n.) is the person who does that. A sentry is a military guard keeping watch and preventing enemies from entering a camp, fort, or other place. An invading army can besiege (vb.) a fortified city by surrounding it and trying to cut off its supplies. The intention of a siege (the noun) is to starve the residents into surrender, or weaken them enough that it will be possible to overcome their defenses and capture the city. A naval blockade (n. or vb.) is similar: ships prevent necessary supplies from reaching a city or country. It can be very effective in countries that depend on trade for much of their food and other basic needs, as well as weapons and income to keep fighting. During the American Civil War a blockade of the South cut off needed supplies as well as income, because the South had specialized in producing cotton for export rather than diversifying their economy to produce the weapons, equipment, and food they needed to get by on their own. To capture (usually vb.) people or cities is take control of them. An ambush (n. or vb.) is a trap planned to capture or destroy enemy troops. Usually the side that plans the ambush hides most of their troops and makes it appear that their enemies can get an easy victory in a place. Once their enemies have attacked their position, the hidden troops come out and overwhelm the enemy forces. Victory is winning a battle (or a war.) Defeat is losing it, and a stalemate occurs when neither side gains much. An army is troops that fight on land: soldiers. The Marine Corps (pronounced core) troops are amphibious (able to fight on both land and sea) and often lead the fighting in landings and special operations. Air Force pilots fly a nation’s aircraft. The Air Force coordinates with the other military services. It collects information on battlefields and enemy positions by aerial reconnaissance, carries paratroopers who will parachute behind enemy lines, drops bombs, and tries to shoot down enemy planes. The military forces of a nation are built up by voluntary enlistment, in which people choose to sign up for a term of service, or by conscription, in which the nation requires some or all men (or all people) of certain ages to join. A fleet is a group of ships that travel together. Battleships do the main fighting on the seas. 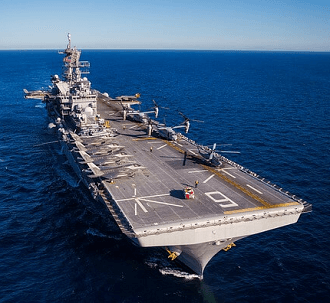 Aircraft carriers have very large decks to carry airplanes and allow them to take off and land on the deck. The airplanes are used for reconnaissance (discovering enemy positions and numbers) and bombing. Troop transports carry large numbers of soldiers across the water to the places they intend to fight. Submarines (often called “subs”) travel underwater to attack ships from beneath without being seen. As mentioned, aircraft can serve to gather information, bomb enemy positions, fight against enemy aircraft, and carry paratroopers. Helicopters can maneuver, take off, and land in tight spots that airplanes cannot. This makes them very useful for rescue missions. Tanks are offensive armored vehicles with big guns. They move on tracks connecting the wheels, so they can go into places many trucks could not reach. Uniforms are the matching outfits worn by members of each service on formal occasions. (See the picture under "Armed Forces.") Historically, they were used in battle as well, to make it easy to identify comrades and enemies in close combat. However, they also make troops easy targets for sharpshooters, so in battle soldiers are more likely to wear camouflage now. 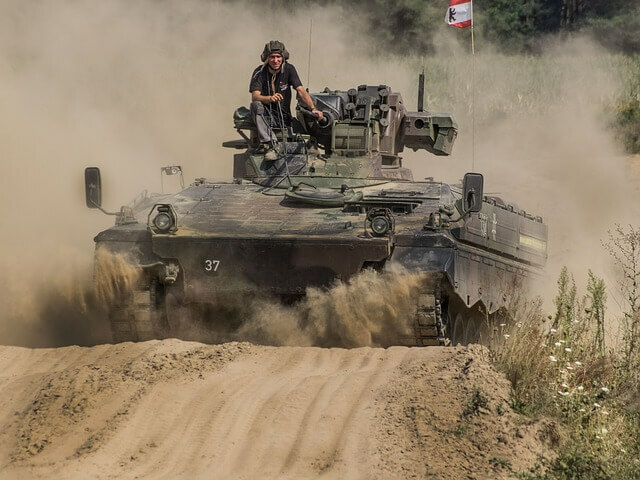 Camouflage is clothing or vehicle coverings that blend with surroundings to make it harder for the enemy to see (or aim at) troops or equipment. Helmets are hard head coverings to protect the head and often the neck. Armor protects the body (especially the chest, but often also back, arms, legs, and hands.). It can be made of metal pieces fastened together so they allow movement or heavy quilted cloth. Knights in the Middle Ages often rode into battle almost completed covered in armor, with a headpiece that completely covered the head and face as well, except for narrow openings for eyes, ears, and mouth. 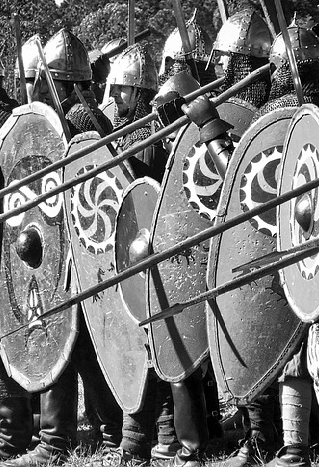 Shields are large oval or rectangular pieces of metal (or other firm material) that can be held in from of the body and moved to block swords, spears, or arrows. 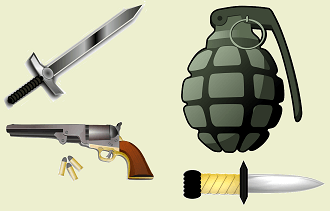 All of these except swords, knives, and mines are designed to be used at a distance. Guns are weapons that shoot metal bullets over a distance. An automatic fires multiple shots without reloading. A rifle, like an automatic, has a long barrel. A pistol is a type of handgun, smaller and easier to carry or to conceal (hide). The verbs for using guns are ‘to shoot’ or ‘to fire’, so soldiers might hear or be attacked by gunfire or gunshots. Grenades are hand-held explosive devices that can be thrown to blow up a vehicle, building, or group of people. Land mines are buried devices that explode when someone or something puts weight on them. Missiles are explosive objects sent to blow up their target. They can be self- or remote-controlled and can even be nuclear. Torpedoes are missiles fired from ships or submarines or dropped from the air. They explode on impact, to damage or sink ships. 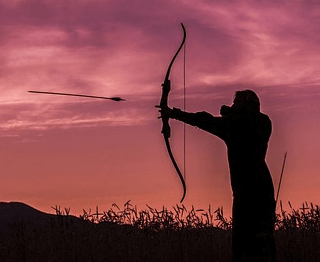 Archers use bows to shoot arrows for much longer distances than spears can travel. Swords are long sharp weapons used in hand-to-hand (close) combat or from horseback. Knives are similar, but shorter. 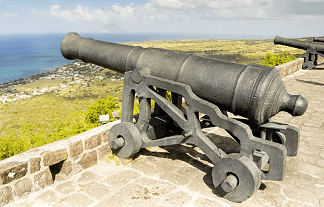 Cannons are heavy long metal tubes with a gunpowder-loading mechanism at the end. They shoot iron cannonballs or smaller ammunition like grapeshot or explosive shells from a distance. 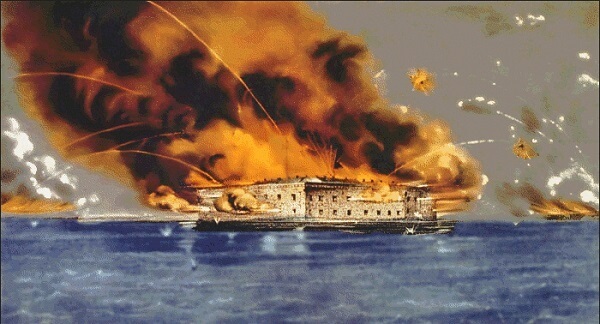 They can break down castle or fort walls and knock holes in the side of ships, causing them to sink, as well as kill many soldiers in the field. Cannons were introduced to Europe from China in the Middle Ages, and were still major killers during World War I and II. A signal is a message sent without words. It can be a hand or body gesture, a light, fire, or smoke, or a sound—possibly a certain number of gun shots that the sender and receiver have agreed on. Written codes can be very complicated, substituting numbers for letters, certain words for other words, or even changing letters according to a machine that the other person must also have to understand the coded message. The purpose of propaganda is either to convince a nation's own people or troops that the enemy is terrible and the war is worth its costs, or to discourage civilians and military personnel on the enemy side and cause them to doubt the value of continuing to fight. If you want to see these terms in context, you can find much of this war vocabulary on many history or news websites. One place to start is this History.com page on D-Day (Allied landings in the North of France in 1944, as the start of a campaign to take back western Europe from Nazi Germany. There’s also a closely related page on EnglishHints: Vocabulary for Violence.